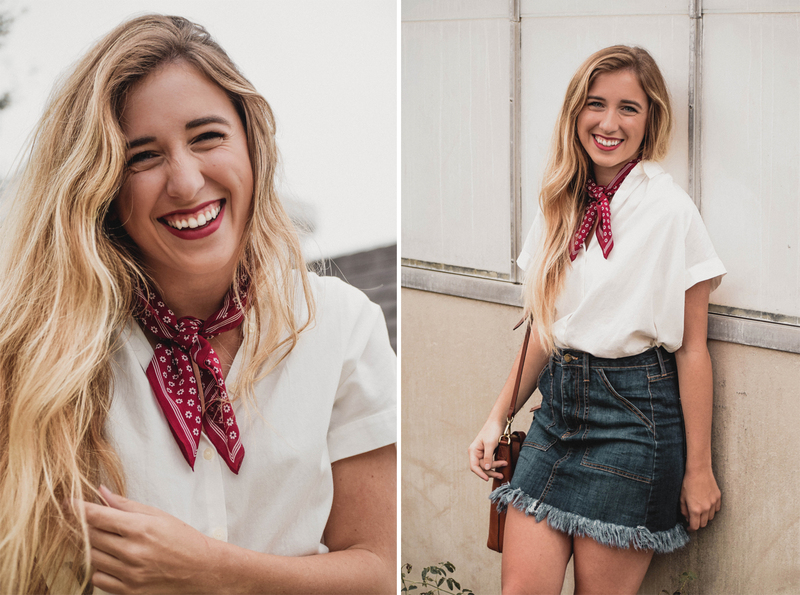 Scarf: Madewell silk scarf | Shirt: Madewell central shirt | Skirt: Red Dress Boutique denim skirt (on sale!) | Shoes: Similar here | Bag: Madewell transport tote | Earrings: Pearl stud earrings | Lips: Revlon ColorBurst lip balm in "Sultry"
I'd like to start today off by giving a little shoutout to my sister. 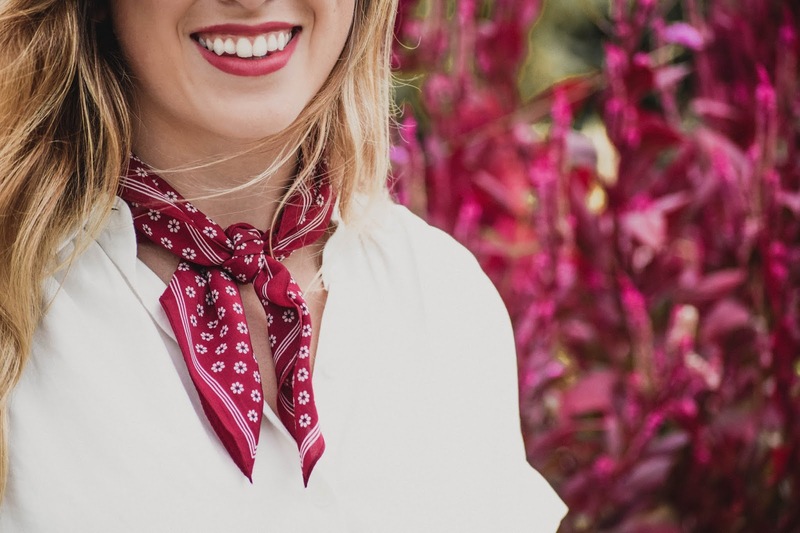 She's been rocking the silk scarf trend for months now, and while I've loved tying them in my hair, I never thought I could pull them off around my neck like her! 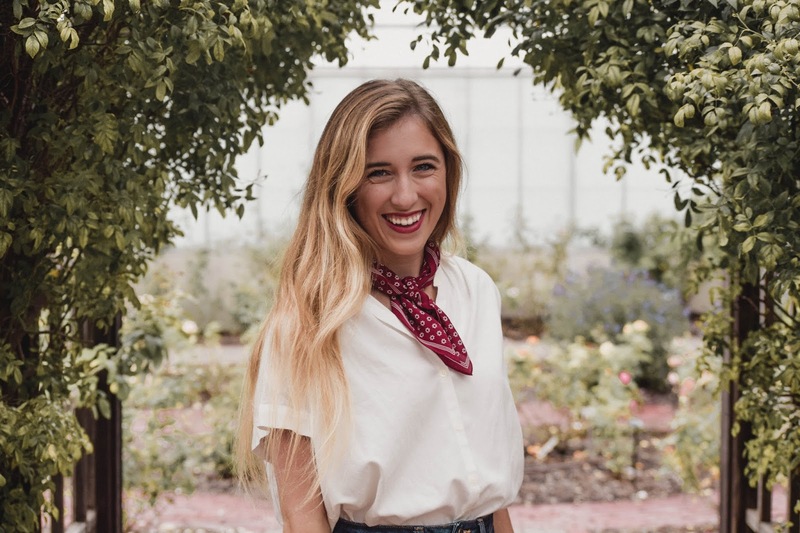 But, I'm happy to report that I styled it like my sister this week, and I'm loving it! 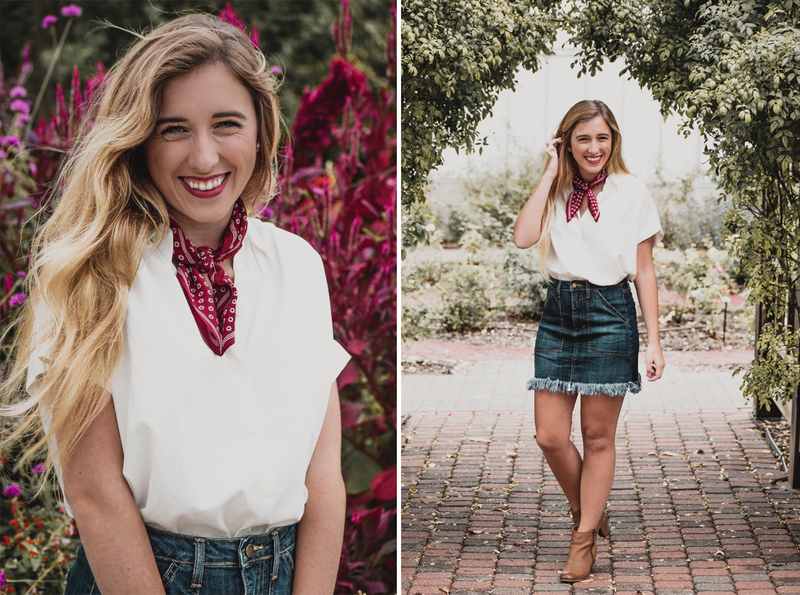 Paired with a white button down and denim skirt, this patterned bandana from Madewell was the cherry on top of this transitional fall look! 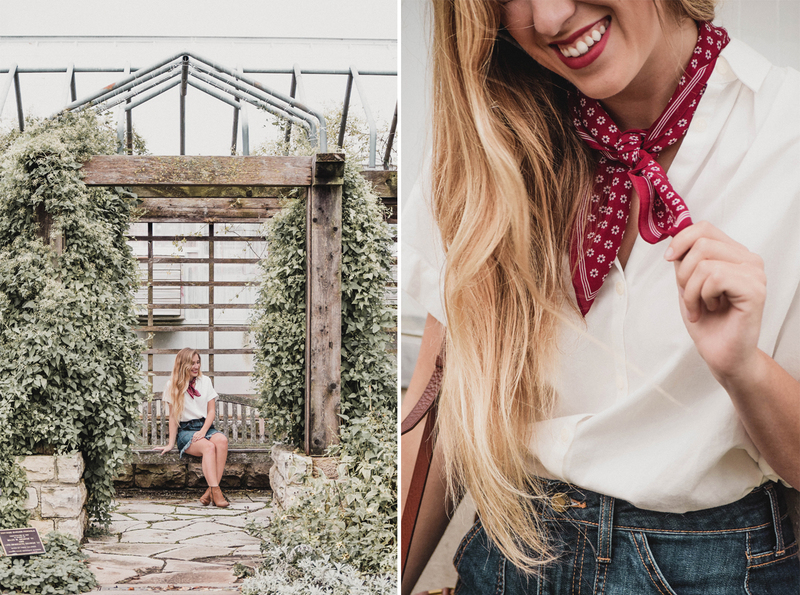 Madewell's silk bandanas are by far my favorite because they're so soft, come in tons of patterns and are the perfect size for any purpose – scarf, headband, hair bow, tie it onto your bag, you name it! 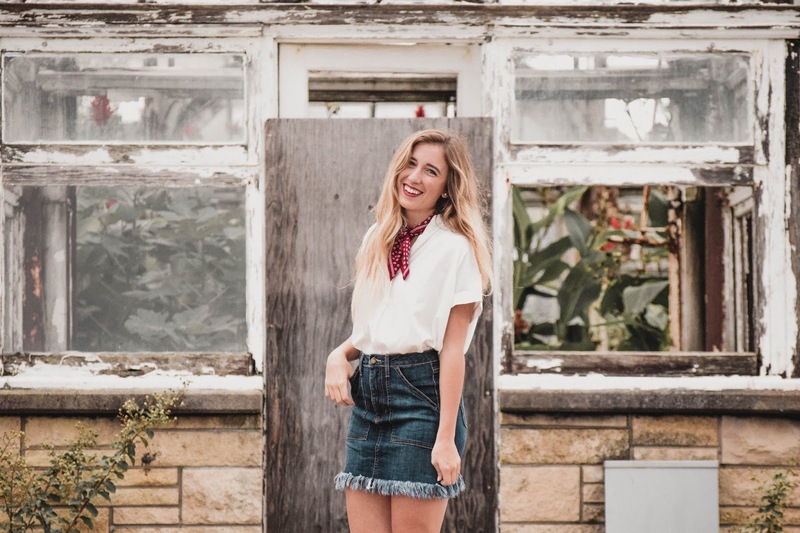 I also want to make sure y'all know that my denim skirt is almost 50% off right now! 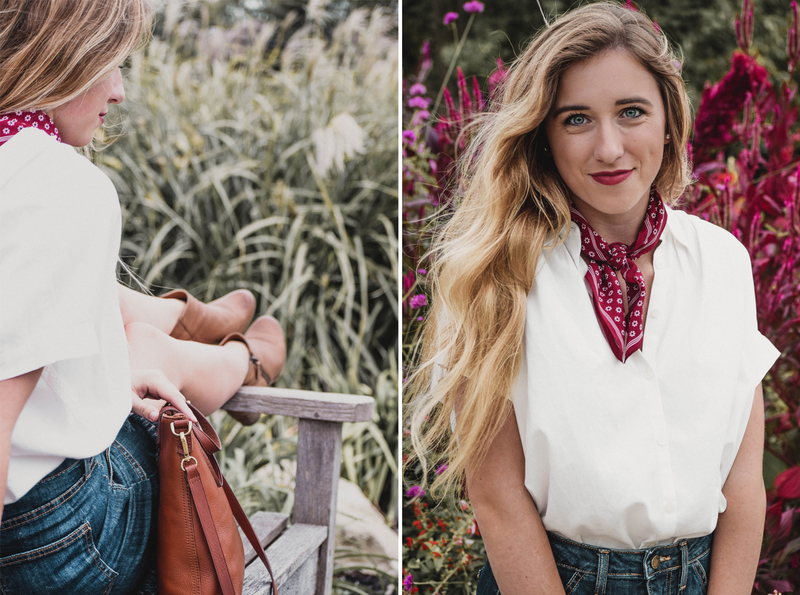 It's my favorite at the moment because of the cute fringe hemline; plus, it's super stretchy and comfortable and has really deep pockets that are great when you don't want to carry around a purse! On another note, I took these photos at the gardens at K-State, and it is all so pretty this time of year. 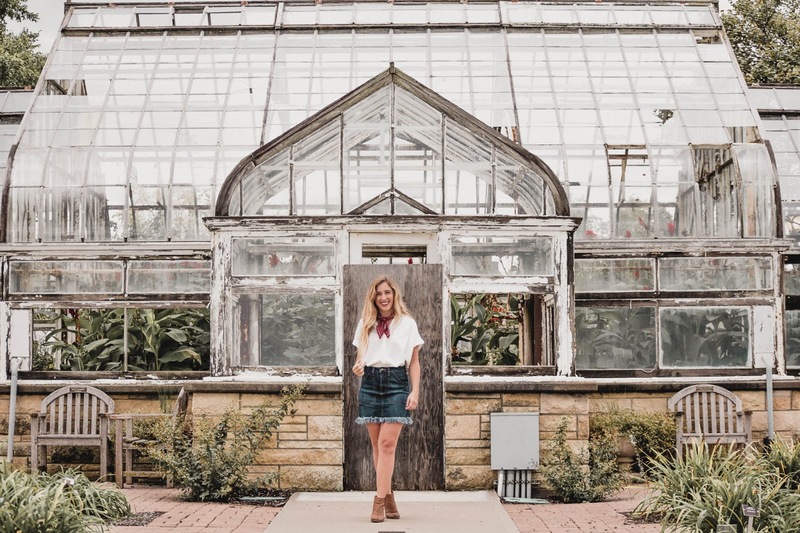 My friend Nicole and I had fun walking down all the paths and peeking in the greenhouses. I would totally recommend taking a stroll if you have some free time in Manhattan! 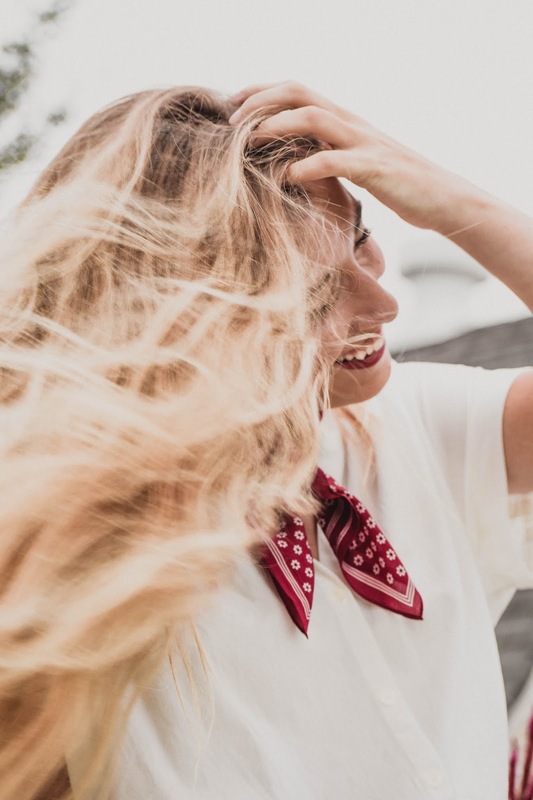 It was also a rainy day – much like the entirety of this week – and on top of making the decision to not take a straightening or curling iron to my hair, the humidity had a bit of fun with my waves haha! So, for those wondering what my natural hair looks like, this is it! 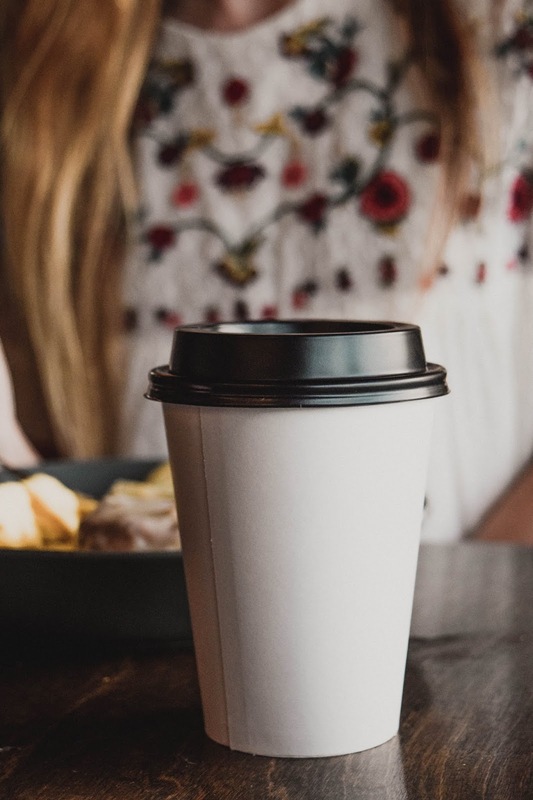 How has y'all's week been so far? Like I said, it's been very rainy where I live lately, and I've been having a slightly hard time adjusting to the cooler weather (sunshine please come back!!). But, despite all that, it's been Homecoming week at K-State, and it has been a blast so far! We still have the parade tomorrow and the football game Saturday, and I can't wait for both of those, too! I hope y'all are just as excited for the weekend, and I'll talk to y'all here again tomorrow!